LP deeply understands the drive of professional athletes and sports enthusiasts to overcome limits. As a result, LP has developed the EmbioZ series to help prolong the duration of exercise while achieving peak performance. Integrating sports biomechanics, kinesiology, and injury analyses with ergonomic technology, the EmbioZ series acts as the invigorator that enables athletes to unlock unlimited potential for athletic performance during training and competition. As the leading brand in sports protection, LP shares the athletes’ desire to stay in the game and achieve breakthrough performance. That’s why LP developed the EmbioZ series. LP EmbioZ series aims to inspire extraordinary possibilities, enhance your sports performance and provide optimal comfort during training by developing the technique of Power System, Comfort System, Seamless Tech, Power Band, General Compression and Gradient compression. Power System provides excellent support and coverage to reduce excess muscle tremors and energy consumption, improving operational efficiency. Furthermore, it reduces muscle fatigue during prolonged exercise, helping maintain an optimal level of athletic performance. Unique Power Band and Square Buffer designs accurately increase sensory input to enhance proprioception, which improves posture, stability, and coordination. Better proprioception is key to avoiding sports injuries. During exercise, Power System increases the sensitivity of proprioceptive receptors to enhance physical control. For this reason, athletes can respond accordingly to avoid injuries caused by excessive movement. Improved proprioception helps muscle fibers respond to intense exercise by increasing the amount of activity and strengthening muscle contractions. Power System helps activate major muscle groups to increase their function and stabilize surrounding bones. By maintaining proper joint positions, it helps prevent poor posture during intense exercise. It is important to maintain a balanced body temperature during training and competition. This keeps muscles and joints in an active state of readiness, boosts nerve conduction and reactivity, and reduces the chance of injury. However, long periods of high tension or intense exercise lead to a continual increase in body temperature as well as superficial vasodilation. The excess heat is then transferred to the surface of the skin, affecting muscle function and performance. Thus, LP has developed Comfort System to regulate temperature and humidity, allowing athletes to keep comfortable during prolonged or intense exercise, thereby enhancing athletic performance. During strenuous exercise, the accumulation of heat and moisture across the surface of the body can cause stifling discomfort. 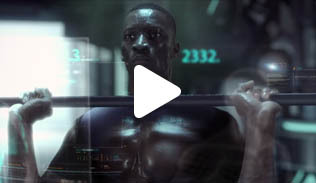 The unique sweat absorption capabilities and highly efficient breathable design effectively remove sweat while regulating body temperature, allowing athletes to remain dry and comfortable during long training sessions. Integrated stitching improves on the shortcomings of multi-block fabric splicing. This technique reduces the amount of thread and increases contact with the skin, providing continuous, smooth coverage for the limbs and torso to enhance comfort levels during exercise. Seamless Tech reduces the number of protruding or uneven threads, effectively eliminating discomfort from chafing during exercise. If fabric does not fit evenly, pressure will be generated across the folds, causing discomfort during exercise. 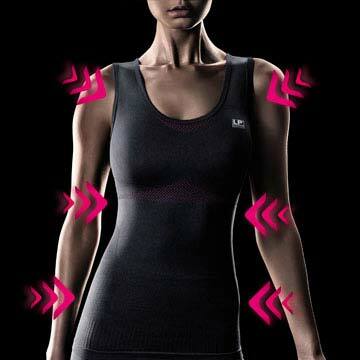 Seamless Tech reduces the amount of thread and folding around joints for a closer, more even fit. Based on the same basic technical concepts employed by kinesiology tape, Power Band stimulates muscle contractions, stabilizes joints, and increases the flow of blood and lymphatic fluids through pressure, elasticity and recoil. LP developed Power Band concept to target, stimulate, and reinforce specific muscles according to the principles of biomechanics and muscle dynamics in various sports. The surface of the skin contains a vast array of sensory receptors. During exercise, Power Band continuously stabilizes and stimulates muscles, improving proprioception while increasing the number and speed of muscle fiber contractions. These functions enhance the explosive strength of muscles during exercise. The elasticity of Power Band can shift the direction in which skin is moved, increase sliding between skin and muscles, and affect the flow direction of subcutaneous tissue, allowing the fascia to remain unobstructed while improving lymph and blood circulation. These functions help remove metabolic waste resulting from inflammation and help prevent pain. By providing consistent pressure for blood circulation and a pump action for muscle contractions during exercise, General Compression speeds up the return of blood to the heart and accelerates the removal of metabolic waste. Stable pressure on arteries increases blood flow velocity, thereby improving blood circulation, accelerating the supply of oxygenated blood, increasing oxygenation of the muscular system, and enhancing the oxygen uptake in tissue. Stable pressure on the lymphatic system reduces the outflow of lymphatic fluids and accelerates reflux speed, preventing accumulation in the limbs and muscles, and reducing the incidence of muscle edema and swelling. By applying pressure, General Compression helps transport blood from the lower extremities back to the heart. Along with maintaining muscle contraction efficiency and intensity during exercise, this accelerates circulation and lactate metabolism to help delay aching and fatigue. During exercise, the primary muscles, the secondary groups around joints, and the ligaments contract or produce tremors. 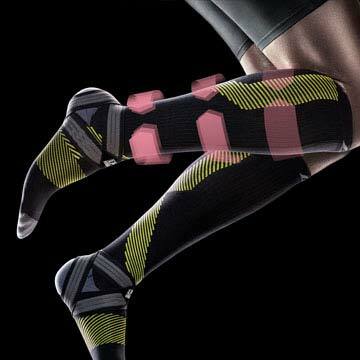 General Compression helps prevent excessive muscle activity, effectively reducing tremors and energy consumption. Increased physical activity often leads to joint swelling. Poor blood circulation can worsen it, increasing the likelihood of injury. General Compression accelerates lymph reflux to prevent the accumulation of lymphatic fluids in limbs and muscles, reducing the rate of muscle edema and swelling. At the same time, it helps prevent injury by decreasing the degree of muscle vibration, which reduces pulling on tendons and joints. In the human cardiovascular system, blood is pumped out by the heart, while its return flow is driven by muscle contractions and venous pressure. The rate of recovery after a workout is dependent on the rate of blood and lymph circulation. Through varying progressive pressure, Gradient Compression can stimulate circulation, stabilize muscles and joints, and eliminate excess muscle vibration to help achieve an optimal level of exercise. After intense or prolonged exercise, metabolic waste, blood, and lymph often accumulate at the distal part of extremities, impeding circulation or causing swelling. These effects hinder the removal of metabolic waste produced during rigorous workouts. During exercise, Gradient Compression provides a supplementary pumping action to help return stagnant blood and lymphatic fluid to the heart. By improving blood and lymph circulation, facilitating the exchange of oxygen and nutrients, and speeding the removal of metabolic waste, this function reduces fatigue and increases the rate of recovery. During intense exercise, powerful muscle contractions and external shocks cause muscle vibration. Excessive or frequent agitation in turn causes strain on tendons and joints, affecting athletic performance and leading to injury. 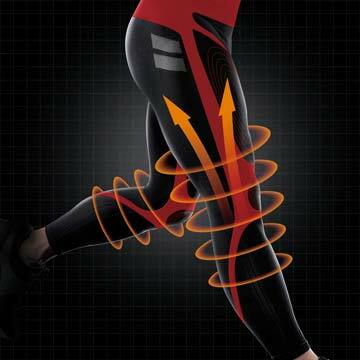 External pressure can effectively reduce the degree of muscle vibration to help prevent injury. Applied pressure also reduces muscle fiber recruitment to cut down on excess energy consumption. This function promotes the release of stored energy, while improving muscle endurance and efficiency of movement to help athletes stay at their performance peak. 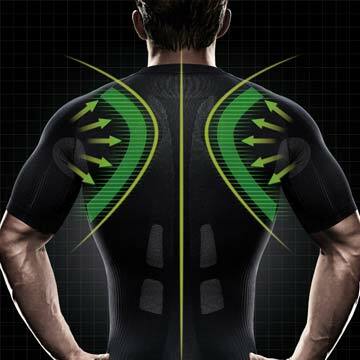 The LP core-supporting garment makes use of five technologies that are specifically designed for professional athletes – Power System, Comfort System, Seamless Tech, Power Band, and General Compression– to fully fit muscles and apply compression to major muscle groups and joints. 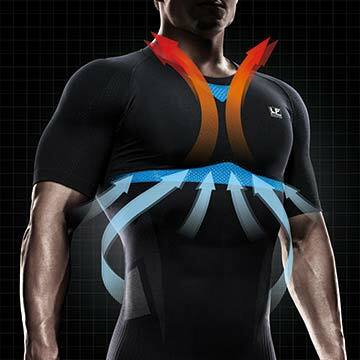 Besides effectively enhancing proprioception and reducing muscle fatigue during prolonged exercise, the special design can also regulate the body's heat and humidity levels to maintain comfort during exercise. These five innovative design elements are combined to offer the most complete technological experience, providing professional athletes precisely what they need for more outstanding performance. LP EmbioZ- Power Sleeve inspires extraordinary possibilities with three main technologies. Combining Power Band, Seamless Tech, and General Compression, LP EmbioZ Power Sleeve not only improves stability and coordination but also increases blood circulation to prevent fatigue. It provides the best experience to help professional athletes enhance sports performance and open up limitless possibilities. Based on functional structure of ankle and surrounding muscles, EmbioZ socks are designed with special heel straps informed by kinesiology theory to enhance sensory perception and improve balance, strength, and explosiveness. Buffer protection design cushions impact to provide excellent comfort. 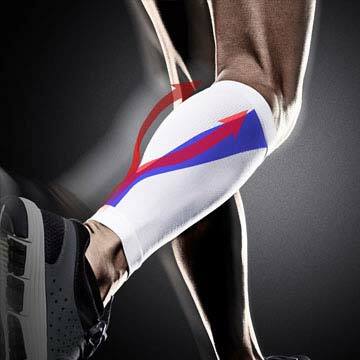 Compression can enhance blood circulation to reduce fatigue. The perfect union of these three concepts brings athletes the ultimate experience in comfort and performance enhancement.